In the spring of 1941, as Londoners endured the Blitz, Noel Coward decamped to Wales to work on a new play, Blithe Spirit, 'Very gay, superficial comedy about a ghost, feel it may be good'. Six days later, it was written, and now, more than seven decades later, Bawds have treated us to another visitation. Charles Condomine is a novelist researching a new book. To this end, he's invited round a local mystic, Madame Arcati, to conduct a seance for him, his wife (Ruth), and some friends (Dr. & Mrs. Bradman), but with the subterfuge of exposing her as a charlatan and using her as subject material. An unexpected result is the appearance of the spirit of Elvira, his 'morally untidy' and seven years departed wife. As Condomine is the only one who can see or communicate with her ghost, confusion and pandemonium follow. Ruth and Elvira compete ruthlessly for his affections, and chaos ensues. 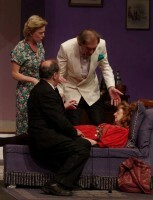 Sally Marsh's production had all of the values one would expect of this splendidly silly play. She presented the era perfectly with her combination of set, props, and costumes. Her cast captured the period style wonderfully without lapsing into caricature and the piece had the fluidity and clarity that one expects of a play where the words are everything. The mood development from the refined and constrained politesse of the first act to the hysteria and anarchy of the second act was as subtle and natural as the text allowed, and the denouement delivered with style. The cast were, without exception, excellent. Coward's dialogue demands pace, cue bite, and impeccable delivery. That the cast met this challenge admirably on the first night is a tribute to their talent and hard work. 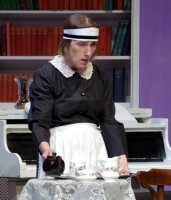 Edith the maid (Kathy Wholley) is an ex-wren who is still all-at-sea. Lost in the landscape of the Condomine household, her preferred response to her master's voice is to set sail at-the-double. 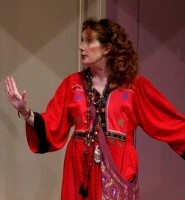 This is a role that depends largely on visual humour, and Kathy produced a finely honed and skilful comedic performance to the delight of the audience. Ruth Condomine (Christine Stewart) is a woman who watches her husband fall back in love with his invisible, ex-wife's ghost. Yet despite this implausibility, she was totally believable. Her unfair treatment at the hands of Condomine was plain to see and as she transformed from loving wife to scorned lover, her pain and anger were shared by all. 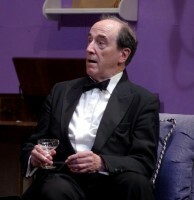 Charles Condomine (Barry Brown) played the part of an astral bigamist with humour as dry as his martinis. Incorrigibly selfish, his rapture on reunion with Elvira contrasted beautifully with that of the unhappy and furious reaction of Ruth. His descent into despair caused by the ensuing conflict was delivered with such a masterful balance of empathy and comedy that we almost felt sorry for the old philanderer. Mrs and Dr. Bradman (Brenda Cottis and Hugh Mellor) along with the Condomines, made a perfect four. Their scenes together were natural, pacey, funny, and totally believable. 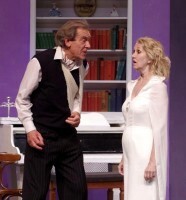 Suzanne Jones portrayed Elvira with a blithe, ethereal and capricious quality that was the essence of Elvira right down to her ectoplasm. 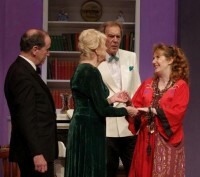 Madam Arcati (Geraldine Hindley) was gloriously batty, the full belfry in fact. Resembling a pre-Raphaelite gypsy fortune teller, her belief in her own meaningless psychobabble was convincing to the point where it put the ok into hokum. Lights (Mark Easterfield) were spot on, and Graham Potter's sound very evocative and well judged. Costumes were set perfectly in the era. The ghostly mantles of Ruth and Elvira were particularly effective, but the star of the non-speaking parts was Ron Meadows. His multi-functioning, candelabra-collapsing, picture-dropping, curtain-billowing, book- throwing, withdrawing room deserves a mention in its own right. Perhaps it really was haunted! 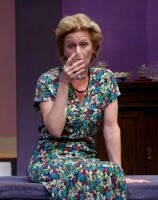 Congratulations to Sally and the cast. 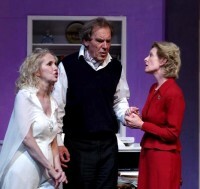 This was a very funny, accomplished and stylish production that deserves the best of houses for the rest of the run.